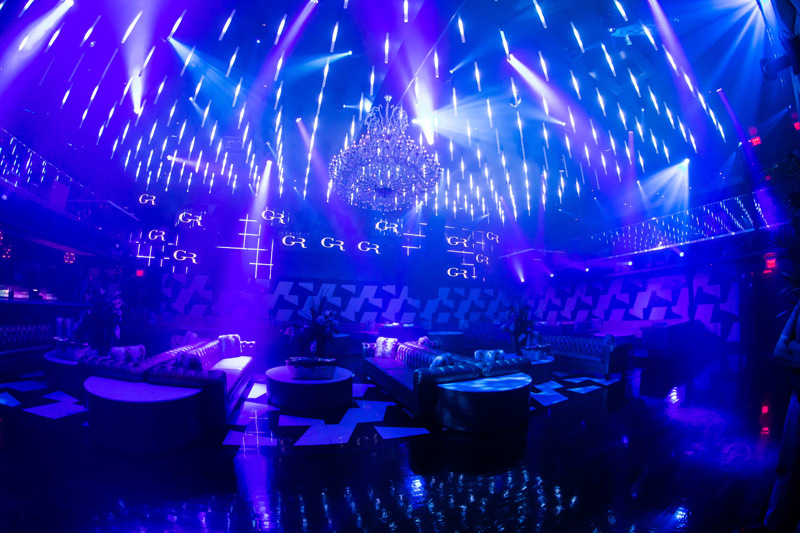 The Atlanta, Georgia nightclub Gold Room is a luxurious, elegantly designed bar with a reputation for high-class events and an unbeatable party atmosphere. However, the team behind the venue felt that their lightshow needed something that has never been done in Atlanta before; not only to make it more effective, but to make it low maintenance and more green too. 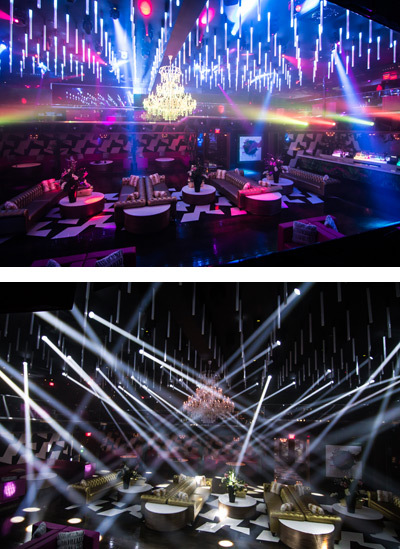 When they contacted Scott Waterbury at Atlanta Sound & Lighting and asked him to take on the job of designing a “4D” elegant, super-technical enviroment, he opted for a highly effective mix of ADJ and Elation gear to give the Gold Room a new, super-efficient, “all LED,” lightshow of epic proportions! Knowing that ADJ, along with its sister company, Elation Professional, could not only provide him with all of the lighting effects required to realize his vision, but also offer help with any issues through our ADJ Group Support service, Scott pulled in 200 ADJ Pixel Tube 360s, 42 Inno Beam LEDs and eight Inno Color Beams, as well as 28 Elation Rayzor Q7s, 24 Elation Platinum Spot LED IIs, eight Elation Enode 8s and 128 rolls of Elation Flex Tape. To work his magic across the immense collection of pixel-mappable effects, he opted for Media Master Express and Madrix – using two copies of each to control nearly 100 DMX universes. This setup meant that the rig was built entirely of LED fixtures – a pioneering moment for Gold Room as one of the first clubs of its size to install such a lightshow. Fed up with wasting energy and funds powering lamps and changing bulbs, the efficiency and low maintenance offered by having this all-LED setup meant that the client’s first demand was met. Another concern was that the technicians and designers at Gold Room were spending their time fixing problems and changing lamps when they should have been busy programing and getting creative with the lighting. With the LED lightshow being almost maintenance free, the staff at Gold Room can spend more time being imaginative and discovering how to get the most out of the system. With the lightshow ticking the boxes for efficiency and low maintenance, freeing up some creative time for the lighting designers, Scott’s next aim was to make the display look 4D, in keeping with the desires of the client. He also wanted to make the lightshow as mesmeric and eye-catching as possible, combining the lighting effects with the décor and other features added by the interior designer, such as the mirrors. One of the stand-out features of the new lightshow is found on the ceiling; where Scott installed 200 ADJ Pixel Tubes, 42 Inno Beam LEDs and 24 Elation Platinum Spot LED IIs. Hanging from the ceiling like glowing icicles and reflecting in the mirrors for a cool ‘infinity mirror’ effect, the Pixel Tubes create a mesmeric, never-ending forest of light. Being pixel-mappable, the tubes also look great when waves of color are sent across them, working with the other pixel-mappable fixtures to create hypnotic patterns that spread across the entire room in one integrated effect. Meanwhile, the Inno Beams and Platinum Spot LEDs mounted on the ceiling offer fast-moving beams that sweep through the crowds on the dance-floor. On the walls, Scott mounted 60” LCD screens, using Arkaos Media Master express to control them as one matrix. He also created cool patterns on the walls using Elation Flex Tape – tape fitted with pixel-mappable LEDs that can be incorporated into the décor of a venue. Working together, the LCD screens and pixel tape cover the walls, combining with the Pixel Tubes on the ceiling to offer unique, integrated pixel effects and video images from floor to ceiling. Presiding over all of this pixel-mappable LED excitement, Scott installed 28 Elation Rayzor Q7s, whose combined LED wash/beam effects offer speed and power; projecting cutting beams down into the crowd and washing dancers in color using high-impact quad-color LEDs. 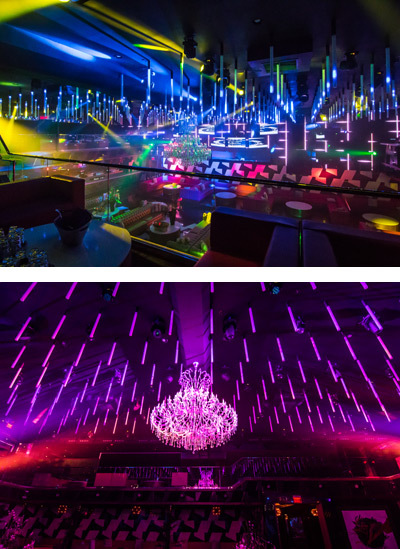 Thanks to our LED moving heads and pixel-mappable LED effects, Scott was able to integrate every element of the lightshow to really give the Gold Room a ground-breaking new look and create a truly unique atmosphere for the venue’s clientele. This integration gives the lighting designers at Gold Room limitless creative potential, allowing them to generate incredible effects – such as a fire effect that starts on the Pixel Tubes and spreads down the walls through the pixel tape. With the lighting designers able to create eye-catching effects, scene after scene, at the touch of a button, they can now follow the DJ on the fly using various different playback scenes, in turn allowing them to react to the behavior of the crowd and the musical landscape. This flexible control also allows the energy in the Gold Room to be built up throughout the course of the night, giving the audience a unique ‘experience’ rather than just a night out. The client wanted Gold Room to be a one-stop venue; a place to go for a relaxed drink and then a night on the dance-floor. 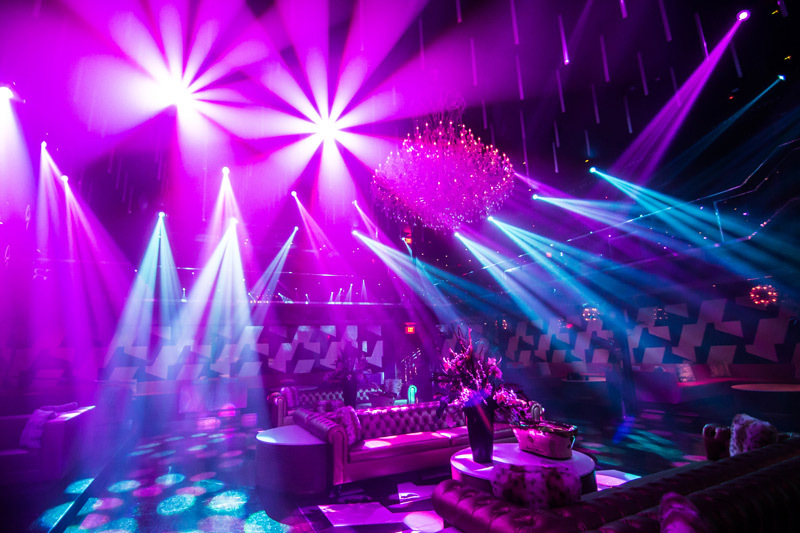 With the versatile and customizable new lightshow, Gold Room can be adorned with an ambient atmosphere and smooth, subtle lighting during the evening and build-up, naturally, to become an energetic club over the course of the night, providing new levels of pure lighting excitement for its guests.